There is an 18-foot limestone obelisk that stands quietly at the intersection where East Meyer Boulevard, Brooklyn Avenue, and The Paseo converge near Dunn Park in Kansas City, Montana. There are metal stars affixed to three of its four sides: gold, symbolizing those who died in World War I; blue, symbolizing those who were wounded; and white, representing those who returned uninjured. 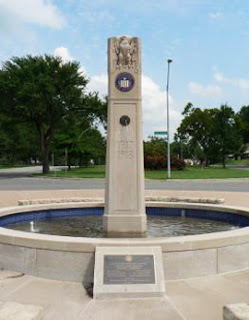 The American War Mothers insignia adorns the fourth side of the fountain. It serves as a solemn reminder that under the uniforms of any branch of the Armed Forces, servicemen and women were once children who played on the front lawn like any children, perhaps with their mothers casting a glance out the front window with an approving, prideful smile, largely unaware of the sacrifice they would later endure. American War Mothers and related organizations on Memorial Day. American War Mothers was established a perpetual patriotic organization in 1917. It grew out of the bond that many women formed while assisting the war effort at home. Although they were not on the front lines, they too lived a stories of struggle, patience, self-denial, and family sacrifice. Later, their efforts were recognized by a charter granted by the United States Congress in 1924. The Great War, originally cast as the war to end all wars, was unfortunately short lived. With the onslaught of World War II, the charter was amended to include World War II. And then again, it was amended to include the Korean conflict and all future wars. The American War Mothers service flag was seen in the iconic film Saving Private Ryan (1998), adorning the modest home of Mrs. Ryan. But the tie to mothers also underscored the entire film as an ensemble of U.S. Rangers were asked to rescue Private James Ryan, whose mother learns that three of her fours sons were killed in action on the same day. United States Army Chief of Staff George C. Marshall (played by Harve Presnell) shares a letter that inspires his decision to help alleviate Mrs. Ryan from additional grief. Today, it is an organization that intersects with both Mother's Day and Memorial Day, and its local chapters are responsible for many memorials like the one in Kansas City, Montana, and are often distinguished by service flags with blue or gold stars. And these stars have inspired like-minded nonprofit organizations such as Blue Star Mothers and Gold Star Mothers. Although the website of American War Mothers is in redevelopment, both Blue Star Mothers and Gold Star Mothers have active sites as well as several local American War Mothers chapters, such as in Maryland. Blue Star Mothers hold rallies to support active duty servicemen and women as well as various veteran organizations. Gold Star Mothers participate in many memorial events. The group consists of women who have lost a son or daughter in service to their country. Along with these organizations that remember the fallen, there is another organization that not only looks at our servicemen and women as sons and daughters but also as mothers and fathers. Children Of Fallen Soldiers provides a long-term mentorship program for kids who have lost a parent while serving in the U.S. military. When the children are 10-14 years old, the organization accepts applications for acceptance into the America's Dream program. Once accepted, the organization makes a 10-year commitment to assist and empower these children to achieve their goals. Currently, Children Of Fallen Soldiers is also hosting an Expression of Appreciation, which encourages people to write a letter, submit a photo, or create a video specifically for children who have lost a parent. The point of the expressions is to recognize that the sacrifice of servicemen and women isn't exclusively their own. It is a sacrifice that is shared by their families. American War Mothers Is A Liquid Hip Good Will Pick On Memorial Day. At least once a month, Liquid Hip highlights the good will efforts undertaken by courageous people with big hearts. We don't score them. That belongs to you. We chose American War Mothers and closely related nonprofit organizations not only because Memorial Day is a day of remembrance and national pride, but also because it touches on global awareness. While it is easy for some to forget that the men and women who serve in any military are somehow removed while they wear a uniform, the truth is that they are never removed. They are sons and daughters, brothers and sisters, and mothers and fathers who deserve some semblance of reverence as long as peace remains elusive and conflict part of human experience. All four organizations mentioned above, American War Mothers, Blue Star Mothers, Gold Star Mothers, and Children Of Fallen Soldiers, place peace among their highest priorities. And whether you choose to support them or something tied to a different country of residence, we hope you feel the same way.